The project transformed the containers used as posts for the civilian volunteer police into reception rooms for the community. 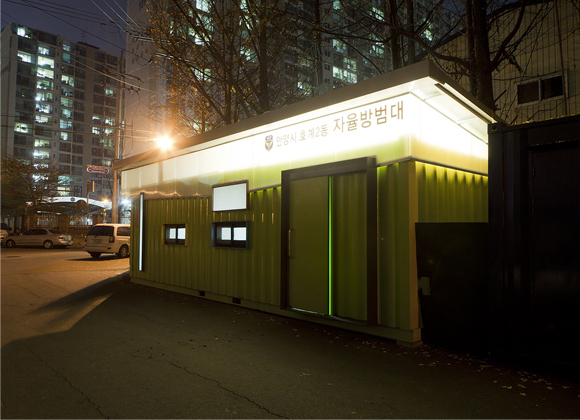 Installed in four locations throughout Anyang, a neighbourhood in southern Seoul, this project redesigned the formerly unwelcoming spaces of the existing containers. Adding features with different functions, such as foldable benches and canopies. We also expanded the usable area through sheltered outdoor spaces. The project was part of the Anyang Public Art Project aiming to showcase and catalyse community projects in the southern suburb of Seoul . 안양시 4개 동(안양1동, 호계2동, 부흥동, 귀인동)에 위치하고 있는 자율방범대 초소를 새롭게 디자인한다. 안양 구 도심과 평촌 신도시에 설치될 이번 프로젝트는 매일 늦은 밤까지 취약지역을 순찰하며 범죄예방을 위해 자원봉사로 활동하는 자율방범대원들이 창고와 간단한 회의 장소로만 사용하는 자율방범대의 기존 역할을 확대하여, 마을을 위해 봉사하는 대원들은 물론 주변 주민들의 만남의 장소로 기능하게 될 것이다.